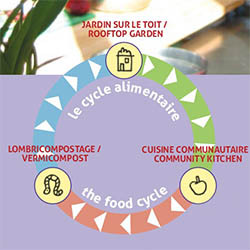 Since 2005, Santropol Roulant has been practicing different forms of composting in an effort to manage kitchen waste and produce rich plant fertilizer. In 2014 the project was taken over by a group of volunteers: the Composting Collective! The compost collective is currently focused on vermicomposting waste from our kitchen and in doing so our building becomes a microcosm of the food cycle: Growing vegetables, herbs and edible flowers on the roof, cooking for the meals-on-wheels in the kitchen, composting the kitchen scraps in the basement and then back up to the roof for fertilization. 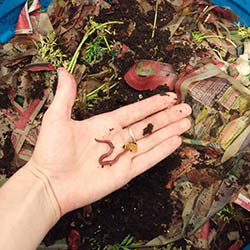 Worms are a great way to process food waste in the city. They don’t take up too much space, they don’t smell, and they work for scraps of food. To boot, their waste is incredibly nutritious for plants. The compost collective is currently working on refining our composting process, harvesting as much compost as possible, and growing our population of worms. Minimizing waste and contributing to a healthy, thriving ecosystem. Providing the community with resources and knowledge to compost at home. Providing the Roulant’s gardens with nutrient-rich vermicompost. There’s lots of ways to get involved in the Compost Collective! We’re always looking for volunteers to help feed the worms. Feedings usually take place weekly in the evenings at Santropol Roulant HQ. Our core members help to maintain the collective, from feeding worms and harvesting compost to building new projects and holding workshops. Responsibilities include attending group meetings and contributing to different workgroups.